Following that advice, he auditioned for Cats at 16, and made it to the end before getting cut. The same thing happened the following year. Determined to one day get cast in the musical that started it all for him, Jason enrolled in AMDA and completed the Integrated Program in the summer of 2008. So he gave it one more try, only to make it to the end once more without hearing anything back. A year later—and 10 years after first seeing that fateful commercial—Jason was performing on a Disney cruise line when he got the call he thought might never come. He was finally going to join Cats playing the mischievous kitten Tumblebrutus. Some would call it destiny, others may chalk it up to luck. But as the saying goes, luck favors the well-prepared, and Jason’s experience at AMDA clearly prepared him to take on the role he waited 10 years for. My experience at AMDA was ground-breaking. It was a quick advantage into the world that the 12 year old me dreamed of. I’ll never forget walking to classes on the first day of school. I was listening to “There’s No Business Like Show Business” on my iPod, staring at the buildings, the people, and the famous yellow cabs thinking “This is my life. I’m doing it, I’m a New Yorker - I have to get a hot dog”. What are some of the benefits of studying in [New York/Los Angeles]? The benefits of studying in New York and Los Angeles are obvious. You learn about a specific actor and on your lunch break, you stand behind them at Starbucks. You learn about a specific theater, and you walk past it on your way to dinner. Keeping my goals in sight was a given, because what I was aiming for was only 10 blocks downtown as opposed to 500 miles away. The shows are advertised on the phone booths and the cabs you pass on your way to class. There is no getting distracted, because you are living in the center of the show business universe with the people who have done it, will do it, and see it. It’s also a great opportunity to network with theater students at the other New York schools. It’s a smaller world than you could ever imagine. It also makes the transition into being a working actor seamless because you don’t have to make the big “move” when you graduate - you’ve been there taking classes and doing laundry and you know your way around. If waking up, going to Starbucks on 8th Avenue, Singing Show Tunes until you have to dance 42nd Street, Eating lunch in Columbus Circle, Commanding the stage in a Shakespearean scene, and then eating dinner at the Carnegie Deli before seeing a show on Broadway just to wake up and do it again sounds like your dream day - You have GOT to go to AMDA, because that could be yours 24/7. What do you feel is unique about AMDA’s programs? You don’t spend 4 years studying shows that you’ve never heard of. You study the shows that you saw as a kid. You study the shows that came through your hometown when you were in High School. You study the show that you saw last night. You study the show you can see tomorrow night. You study the show that is “most played” on your iPod. Another thing that I found amazing, was that the performers I grew up reading about and listening to in Cast Recordings, people I tried to sing like and would watch on YouTube with my friends, were now my teachers and they knew me by my first name. At other schools, you get many teachers who couldn’t make it, so they moved back to the Midwest and taught. At AMDA, you get teachers who are currently working who may even move your class up an hour early because they are nearing their nightly half hour call on Broadway. At AMDA, you can have a teacher work with you on a pirouette at 6:00pm, and see them do it on Broadway at 8:00pm. What other actors, directors and professionals have helped shaped you since you graduated from AMDA? Dropping AMDA’s name has made networking easier than ever. Because of it’s two central locations, everyone in the business has heard of it. It has allowed me to start professional conversations with people I admired without sounding like a wannabe. Using AMDA’s name, you automatically have your first New York credential and it certainly adds legitimacy to your talent and your ambition. 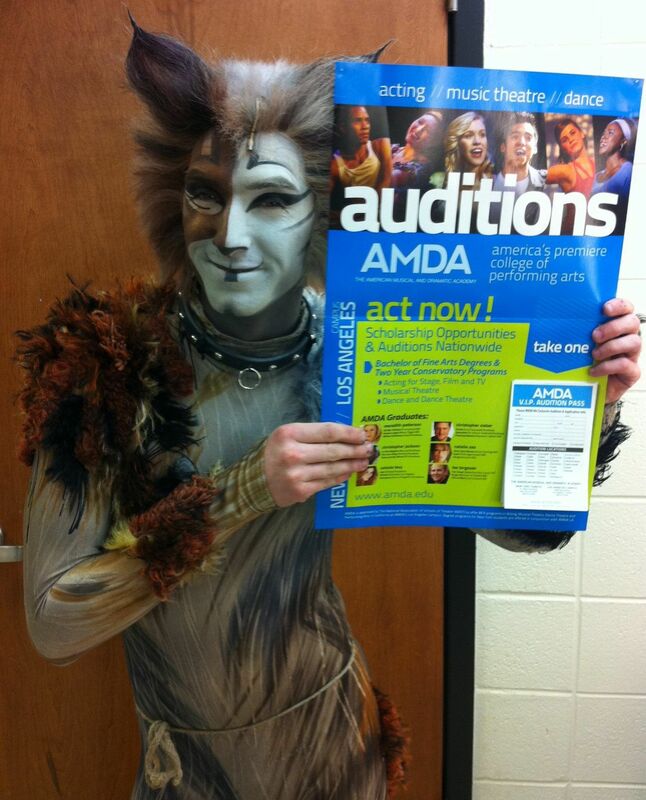 Right out of AMDA, I got cast in the Broadway National Tour of CATS - a job that I only got, because I was in New York with AMDA and was able to be at the audition during my 4th semester. I am nearing 450 performances, worked with the original Broadway choreographer Gillian Lynne, and also joined the Venezuelan, Colombian, Panamanian, Costa Rican, and Canadian companies of the show. It has taken me all over the world from Honolulu to Hollywood. You are all going to work. Not only are you getting the requirements, but you’re also getting a little extra boost. I see kids at auditions who did not have the same training I had, and they stand out like a sore thumb. You have absolutely no reason to get nervous at your auditions, because AMDA has taken care of you and these are not things you will fully understand and appreciate until you are out there in front of the table. So in the meantime, floor bar it up and drop those vowels - you WILL lay on a giant oven in a cat costume and go into Downward Dog - I can promise you. Also, enjoy listening to other classmates work on their songs. After hearing Andrew Lloyd Webber eight nights a week, I would do anything to hear someone sing “Purlie” or “I Can Cook Too”. How about for recent graduates? See you all on 45th Street.